Lei's Poke Stop: This Hawaiian restaurant at 1142 N. Muldoon Road (in Tikahtnu Commons) opened in April. The business used to be in Midtown Anchorage with the name Aloha Stop & Shop, but closed in October. Co-owner Tasha Kahele and her family opened the new eatery as Aloha Poke Stop. But then the shop got a letter from a Chicago company called Aloha Poke Co., which has sent such letters to businesses that use "Aloha Poke" in their names, claiming trademark infringement. "We received the letter to cease and desist using the words 'aloha' and 'aloha poke' in our business because the company claimed the rights to those words," said Kahele. "We took it to our lawyer. … We decided it would be best for us, rather than fight them, to just rebrand." The business had to rebrand about six weeks after it opened at the new location, Kahele said, and that was an unexpected financial hit. She estimated that replacing their signage will cost thousands of dollars. "We are a Native Hawaiian family being told we cannot use our language in our business and someone else owns the right to it," she said. "We understand trademark and copyright and how that works but … we should have the first right to utilize our language in our business." In a Facebook post, Aloha Poke Co. said it wasn't true that the company has "attempted to tell Hawaiian-owned businesses and Hawaiian natives that they cannot use the word Aloha or the word Poke. … What we have done is attempted to stop trademark infringers in the restaurant industry from using the trademark 'Aloha Poke' without permission." In a photo of the letter Kahele got from Aloha Poke Co. in May, representatives for the Chicago company wrote that "your use of 'Aloha' and 'Aloha Poke' must cease immediately." Lei's Poke Stop also has a food truck called Da Poke Man Express. Brown Bag Sandwich Co.: The sandwiches from Brown Bag Sandwich Co. are making a comeback. The business at 535 W. Third Ave. closed in May. Brown Bag announced on Facebook this week that its sandwiches will now be available at AK Alchemist, a coffee shop and taco stand at the corner of Fourth Avenue and A Street. "We just saw a good business opportunity and we wanted to keep that going," said Marissa Nunooruk, a manager at AK Alchemist. "They wanted to keep Brown Bag still a positive thing. Decided it would be a good idea to do it here, kind of like a partnership, like a little merger." You can buy a Brown Bag sandwich there daily from 11 a.m. to 3 p.m.
Sushi Ya: This sushi restaurant recently moved from West Dimond Boulevard to 3501 Old Seward Highway, where Sushi Yako used to be. The new spot opened at the end of July. The owner, Chong Kim, said the lease at the restaurant's old location was up, and she wanted to expand. "We have a lot of regular customers, people have to wait all the time," she said. "We wanted a little better, expanded place." Arctic Roadrunner: The burger shop at 2477 Arctic Blvd. will have its last day Aug. 18. Richard Sanchis, the founder of Arctic Roadrunner, died last month. Cathy Watsjold, a bookkeeper at the business, said Sanchis had planned for the Arctic Boulevard location to close after his death. "It was per Richard's wishes that it close after his passing, in writing," she said. "It was in his trust." 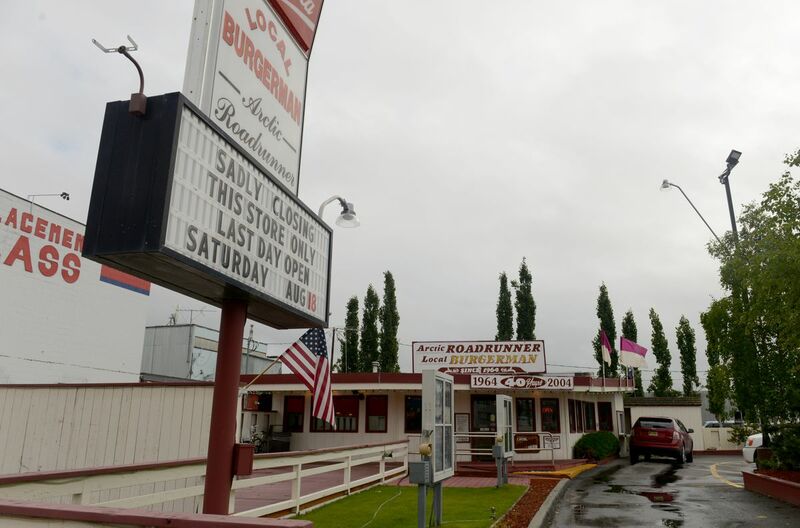 The restaurant's other location at 5300 Old Seward Highway will remain open. Employees from the Arctic Boulevard location will now work at the other one, Watsjold said. Cara Sanchis, Richard's daughter, is taking over ownership of the business. European Watchmaker: This shop at 601 W. 36th Ave. appears to have shut its doors. There was a "closed" sign on the front door Thursday afternoon and the shop was mostly empty, save for paint cans, a trash can and other supplies. The phone number listed online for the shop was not in service when a reporter called.